There is only one winery in the nation that is devoted to providing employment opportunities to people with developmental disabilities. That one special place is Rosewood Winery, located in central Kansas. We’re nestled into the Rosewood Ranch, located in the heart of America, 9 miles west of Great Bend, KS. The Ranch is home to a nationally acclaimed therapeutic horse-riding program and to world-champion horses, for which our wines are named. 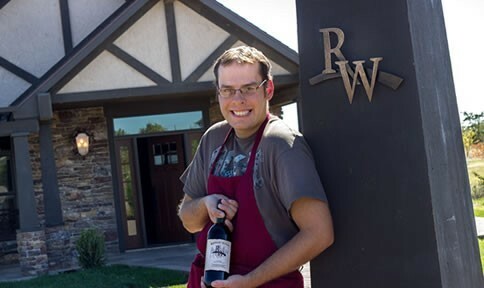 Rosewood Ranch and the Winery offer unique opportunities to persons with developmental disabilities. Founded by Tammy Hammond, Rosewood Services began in 1998 as a way to help people with disabilities to CELEBRATE LIFE! The winery was built for the same reason that Rosewood Services operates a furniture store, a ranch, a greenhouse, an arts studio and an industrial kitchen. It’s a unique opportunity for people with developmental disabilities to find their passion in nurturing environments where they are able to develop skills and self-worth in pursuit of their goals and dreams. Schedule a tasting and a tour today! Our client-employees thrive in a real-world working environment. Find out how! We offer more than two dozen varieties of quality wine, including varieties of reds, whites and blushes. Click the image above to discover other places where Rosewood Wine is sold.